Hey ladies and gents! I hope you're having a wonderful weekend. I'm still working hard at this conference but I'm learning tons of info sorely needed to help advance my practice site! On another note, I want you all to check out what's new at my favorite personal sale shopper, Shop It To Me . See below update. 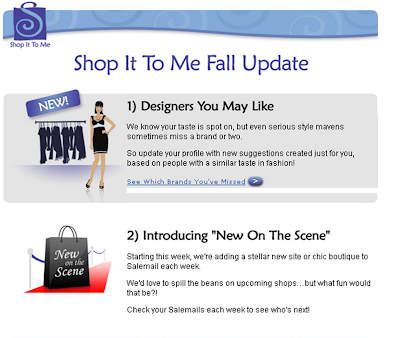 Designer Brand Suggestions: As you well know, Shop It To Me, your free online personal shopper, already sends members customized email alerts when the brands you adore go on sale in you size. We’re now announcing designer brand suggestions created just for you, based on picks from others who have a similar sense of fashion! This list makes it easy for you to add a few brands you may have missed when you first signed up, among the 600+ options available on Shop It To Me. People who are not yet Shop It To Me members can sign up at http://www.shopittome.com/ (or let me know if you need a personal referral link), and can then view their recommendations by logging in to their account. Great post lady. Brandalley Discount Code is another store which gives us great fashionable clothes at very low price.